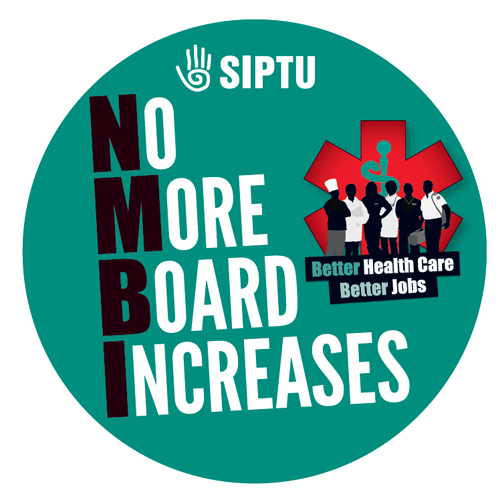 SIPTU Nurse and Midwives, in conjunction with members of the INMO and PNA, will demonstrate against the Nursing & Midwifery Board of Ireland decision to increase the registration fee by 50% for 2015 having already increased the registration fee substantially in 2014. In monetary terms Nurses and Midwives are expected to increase their mandatory registration fee from €80 to €150 in the space of one year and with no guarantee of a further increase in 2016. Our members are determined to confront the NMBI and Department of Health on this unjust increase in fees and have refused to pay the increase already formally notified to them. Come out and show your support for your colleagues against an unjust and unwarranted attack on our member’s pay. SIPTU members are being asked not to feel pressurised by the NMBI renewal notice and to stand together and refuse to pay the 50% increase imposed on Nurses and Midwives by the NMBI. SIPTU and other unions are seeking a cap on the fee of €100 per annum under the Haddington Road agreement that will keep Nurses and Midwives in line with other allied health professionals. Sector Organiser Kevin Figgis said that no state organisation is entitled to increase its income by 50% from a single source and is encouraging all members of SIPTU attend the protest so that their voices can be heard loud and clear by the NMBI. “Our members should not feel pressurised by the renewal notice issued in recent days by NMBI. They have until 30th May 2015 to make a payment under the 2014 regulations issued by NMBI. The employer, in this case the HSE, cannot discipline any member, or require proof of payment, until after that date”. NMBI is seeking to increase the retention fee for members for 2015, from €100 to €150. ‌ Nurses and midwives will hold a public protest, to coincide with the next meeting of the NMBI board, which is scheduled for Tuesday, 18th November. This protest will begin at midday outside NMBI Headquarters, 18/20 Carysfort Avenue, Blackrock, Co. Dublin. SIPTU nurses and midwives are also being asked to send in individual letters of complaint to NMBI outlining their reasons for opposing the rise in the retention fee. SIPTU has urged members in the Nurses and Midwifery Sector to ignore the recent renewal letter sent by the NMBI, to continue the campaign of non payment of the unfair registration increase and to make sure that they attend the protest of the NMBI offices on the 18th of November. Sector Organiser Kevin Figgis said that the protest on the 18th of November outside the NMBI offices in Blackrock, Dublin, is of great importance if SIPTU members are to send the message loud and clear that Nurses and Midwives have had enough and that they are not prepared to pay another unjustified increase or tax on work. When you receive your renewal notice you are asked to make no payment, at this time. Furthermore members are asked to wait further advice, from your unions, as to when a payment of €100 (the existing fee) should be made maintaining a record of such payment. Members should arrange to attend the public protest at 12.00 noon, outside NMBI HQ, on Tuesday, 18th November 2014. Jack O’Connor said: “SIPTU supports the call for a constitutional change which will enshrine the public ownership of water and its supply. This call, which has been made by the Green Party and a number of progressive organisations, will end any drift towards the privatisation of water. “None of the major political parties would openly support privatisation, some because they are deeply ideologically opposed to it, others because it would be so unpopular. Nevertheless, it will still come about by stealth and very quickly too if the citizens of Ireland do not vote for such a constitutional change. “If Irish Water is unable to collect its revenues it will become insolvent. Then the government of the day will be faced with tax increases and public spending cuts associated with putting the costs of water supply back on the State’s balance sheet. The use of ‘private money’ would soon emerge as the solution to such a funding crisis and the creeping privatisation of the service would then ensue. A constitutional amendment could preclude such a tragedy”. Jack O’Connor also reiterated the SIPTU call for a mechanism to fully offset the cost of every households ‘normal need for water’, while preserving the incentive for conservation. He added: “It’s not rocket science. A refundable tax credit is the way to do it. Fiddling around with the issue won’t cut the mustard. It will simply prolong the crisis. In the end, and possibly very quickly, Irish Water won’t be able to collect its revenues thus rendering it insolvent and we will sleepwalk into the privatisation of public water supply”. SIPTU has served notice of protective strike action, today (Friday, 31st October), on Dublin’s six main training hospitals in a dispute over rosters and pay. SIPTU Health Division Organiser, Paul Bell, said: “Following the unilateral decision by the hospital managements to attempt to change working patterns for porters, catering operatives, laboratory assistants and CSSD Technicians, SIPTU has been left with no alternative but to serve notice of protective strike action”. The hospitals involved are St Vincent’s University, Beaumont, the Mater, Tallaght and St Luke’s and the National Maternity Hospital at Holles Street. He added: “These hospitals have been advised by letter that our members will engage in strike action should management unilaterally introduce change to our members rosters and established shift patterns, which management have agreed with workers, will be retained”. Paul Bell has previously informed the HSE and the management of the six hospitals that the Croke Park and Haddington Road agreements contain provisions which protect the earnings of low paid workers in the health service who have already suffered major reductions in pay. SIPTU and other health sector unions have asked Department of Health officials to examine whether an attempt by the Nurses and Midwives Board of Ireland (NMBI) to increase members’ retention fees from €100 to €150 next year breeches the Haddington Road Agreement. The retention fee issue was raised by union representatives at a meeting of the Health Service Haddington Road Oversight Body held yesterday (Wednesday, 29th October). SIPTU Health Division Organiser, Paul Bell, said: “At the meeting the union side stressed the requirement, within the Haddington Road Agreement, that in return for acceptance of the agreement, there would be no further costs incurred by staff. We asked the Oversight Body to ensure that this aspect of the agreement was honoured. “After discussion the Department of Health representative, at the Oversight Body meeting, asked for further time to review the issue. He committed the Department of Health to an early meeting to discuss this issue, as previously requested by the unions. This meeting is expected to take place next week”. Paul Bell added: “SIPTU members are asked not to pay their NMBI retention fee increase and cancel any direct debits for this purpose. Our members have suffered significant financial reductions over the past number of years including pay cuts, the imposition of levies and the Universal Social Charge. “They are not in a position to pay increased fees to NMBI, an organisation which has attempted to impose an increase of nearly 70% in the retention fee over the last two years. The unions hold a collective view that the registration fee should be maintained at the current level of €100. In due course, we will advise members of when and how they should pay this €100”. Nurses and midwives will hold a public protest, to coincide with the next meeting of the NMBI board, which is scheduled for Tuesday, 18th November. This protest will begin at midday outside NMBI Headquarters, 18/20 Carysfort Avenue, Blackrock, Co. Dublin. SIPTU Health Division Organiser, Paul Bell, said: “Minister Varadkar has made a clear commitment on total pay restoration for new entrants to the medical consultant grade. A Labour Relations Commission brokered deal will see these new consultants offered salaries that range from €125,000 to €190,000. “SIPTU is calling on the Minister to show equal concern for the restoration of pay for other health sector workers who earn considerably less. It is these workers who have suffered the most due to cuts in the funding of the health service. Restoration of the pay of these workers will also ensure a boost to the economy as they spend all their wages supporting themselves and their families”. He added: “The continued attacks on the earnings of lower paid health workers will not be accepted. 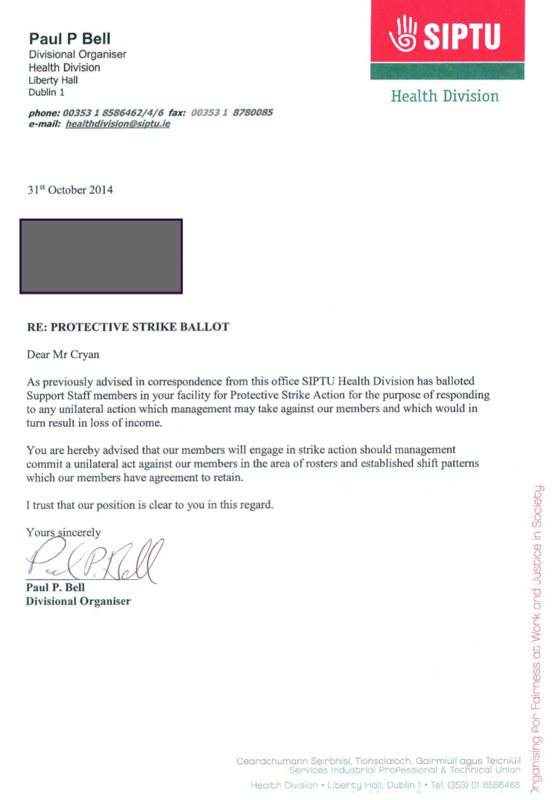 This was clearly illustrated by the ballot for protective strike action by SIPTU support staff members in six of Dublin’s major hospitals last month in response to managers removing them from rosters during unsocial hours and replacing them with interns. Representatives of SIPTU and other health sector unions have asked to meet with Department of Health officials over an attempt by the Nurses and Midwives Board of Ireland (NMBI) to increase members’ retention fees from €100 to €150 next year. ‌All nurses and midwives must be registered with NMBI in order to practise their profession in Ireland. He added: “SIPTU members are asked not to pay their NMBI retention fee increase and cancel any direct debits for this purpose. “Our members have suffered significant financial reductions over the past number of years including pay cuts, the imposition of levies and the Universal Social Charge. Nurses and midwives will now hold a public protest, to coincide with the next ordinary meeting of the NMBI board, which is scheduled for Tuesday, 18th November. This protest will begin at midday outside NMBI Headquarters, 18/20 Carysfort Avenue, Blackrock, Co. Dublin. SIPTU nurses and midwives are also being asked to send in individual letters of complaint to NMBI outlining their reasons for opposing the rise in the retention fee. SIPTU members can download a poster for the protest or upload an image to use as their Facebook or Twitter profile picture.